Should altruists pay for profitable things? People often claim that activities which are already done for profit are bad altruistic investments, because they will be done anyway, or at least because the low hanging fruit will already be taken. It seems to me that this argument doesn’t generally work, though something like it does sometimes. Paul has written at more length about altruistic investment in profitable ventures; here I want to address just this one specific intuition which seems false. Suppose there are a large number of things you can invest in, and for each one you can measure private returns (which you get), public returns (which are good for the world, but you don’t control), or total returns (the sum of those). Also, suppose all returns are diminishing, so if an activity is invested in, it pays off less the next time someone invests in it, both privately and publicly. Suppose private industry invests in whatever has the highest private returns, until they have nothing left they want to invest. Then there is a market rate of return: on the margin more investment in anything gives the same private return, except for some things which always have lower private returns and are never invested in. This is shown in the below diagram as a line with a certain slope, on the private curve. Total returns and private returns to different levels of investment. There won’t generally be a market rate of total returns, unless people use the total returns to make decisions, instead of the private returns. But note that if total returns to an endeavor are generally some fraction larger than private returns (i.e. positive externalities are larger than negative ones), then the rates of total returns available across interventions that are invested in for private good should generally be higher than the market rate of private returns. So, after the market has invested in the privately profitable things, the slope of every private returns curve for a thing that was invested in at all will be the same, except those that were never invested in. What do you know about those things? That the their private returns slope must be flatter, and that they have been invested in less. Private returns for four different endeavors. Dotted lines show how much people have invested in the endeavor before stopping. At the point where people stop, all of the endeavors have the same rate of returns (slope). What does this imply about the total value from investing in these different options? This depends on the relationship between private value and total value. Suppose you knew that private value was always a similar fraction of total value, say 10%. Then everything that had ever been invested in would produce 10x market returns on the margin, while everything that had not been would produce some unknown value which was less than that (since the private fraction would be less than market returns). Then the best social investments are those that have already been invested in by industry. If, on the other hand, public value was completely unrelated to private value, then all you know about the social value of an endeavor that has already been funded is that it is less than it was initially (because of the diminishing returns). So now you should only fund things that have never been funded (unless you had some other information pointing to a good somewhat funded opportunity). The real relationship between private value and total value would seem to lie between these extremes, and vary depending on how you choose endeavors to consider. Replaceability complicates things, but it’s not obvious how much it changes the conclusions. If you invest in something, you will lower the rate of return for the next investor in that endeavor, and so will often push other people out of that area, to invest in something else in the future. If your altruistic investments tend to displace non-altruists, then the things they will invest in will less suit your goals than if you could have displaced an altruist. This is a downside to investing in profitable things: the area is full of people seeking profits. Whereas if altruists coordinate to only do non-profitable things, then when they displace someone, that person will move to something closer to what the displacing altruist likes. In a world where social returns on unprofitable things are generally lower than social returns on profitable things though, it would be better to just displace a profit-seeking person who will go and do something else profitable and socially useful, unless you have more insights into the social value of different options than represented in the current model. If you do, then altruists might still do better by coordinating to focus on a small range of profitable and socially valuable activities. For the first case above, where private value is a constant fraction of total value, replaceability is immaterial. If people move out of your area to invest in another area with equal private returns, they still create the same social value. Though note that with the slightly lower rate of returns on the margin, they will consume a bit more instead of investing. Nonetheless, as without the replaceability considerations, it is best here to invest in profitable ventures. In the second case, where private and public returns are unrelated, investing in something private will push people to other profitable interventions with random social returns. This is less good than pushing altruists to other unprofitable interventions, but it was already better in this case to invest in non-profitable ventures, so again replaceability doesn’t change the conclusion. Consider an intermediate case where total returns tend to be higher than private returns, but they are fairly varied. Here replaceability means that the value created from your investment is basically the average social return on random profitable investments, not on the one you invest in in particular. On this model, that doesn’t change anything (since you were estimating social returns only from whether something was invested in or not), but if you knew more it would. The basic point here though is that just knowing that something has been invested in is not obviously grounds to think it is more or less good as a social investment. 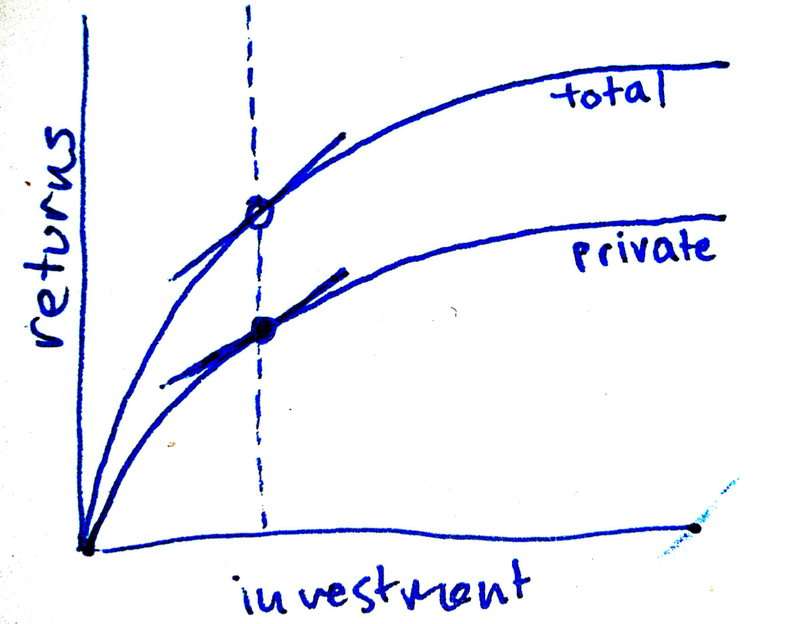 If you think the social value of an endeavor is at least likely to be greater than its private value, and it is being funded by private industry, you can at least lower bound its total value at market returns. Which is arguably a lot better than many giving opportunities that nobody has ever tried to profit from. Note that in a specific circumstance you may know other things that can pin down the relationship between private and total value better. For instance, you might expect self-driving cars to produce total value that is many times greater than what companies can internalize, whereas you might expect providers of nootropics to internalize a larger fraction of their value (I’m not sure if this is true). So if hypothetically the former were privately invested in, and the latter not, you would probably like to invest more in the former.